FILE - A North Korean factory worker walks through a processing hall at the Pyongyang 326 Electric Wire Factory, in Pyongyang, North Korea, Jan. 10, 2017. Some 30 African countries maintain economic ties with Pyongyang, despite global condemnation of its regime. Burkina Faso said it will immediately stop importing goods from North Korea and that it only learned of possible violations of U.N. sanctions through American news reports. The West African country was the top importer of North Korean goods in Africa in 2015, according to the Observatory of Economic Complexity, a website that collects and distributes international trade data. Speaking to VOA’s French to Africa Service, Burkina Faso’s foreign minister, Alpha Barry, said the decision to end imports from North Korea takes effect immediately. “I wrote to my colleagues in Commerce and Finance, and we found out that, from January to August 2017, we imported $7 million worth of goods,” he said, emphasizing that his government wasn’t initially aware of the goods imported from North Korea. Barry said he learned about the deals through news reports in the United States, prompting him to open an inquiry into the matter. “We also found out that in 2015 these imports reached $38 million. These imports are mostly oil products,” he said. In addition to its imports, Burkina Faso exported about $637,000 in oil seeds to North Korea in 2015, according to the Observatory of Economic Complexity. Burkina Faso’s decision to sever economic ties comes amid heightened scrutiny of North Korea’s business dealings. Following the rogue nation’s nuclear test in September, the U.N. passed new sanctions to restrict Pyongyang’s imports and exports. 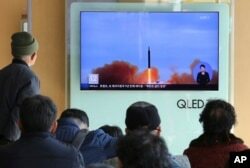 FILE - People watch a TV screen showing file footage of North Korea’s missile launch at Seoul Railway Station in Seoul, South Korea, Nov. 21, 2017. In October, the United Nations banned four ships found to be transporting North Korean goods from world ports. In one case, cargo included 30,000 North Korean-made rocket-propelled grenades. This week, the U.S. requested that the U.N. add another 10 ships to the banned list. Economic ties to North Korea don’t constitute sanctions violations in and of themselves, but the U.N.’s list of banned transactions has grown with Pyongyang’s ongoing nuclear and missile tests. The most recent U.N. Security Council resolution, adopted in September, added imports of natural gas liquids to North Korea and textiles exports from North Korea to the list of banned transactions. Despite increased international scrutiny of associations with North Korea, some 30 African countries maintain economic ties with Pyongyang. “Many African states and populations are unaware of the massive and gross human rights violations committed by Pyongyang,” said Grant Harris, a former senior director for African affairs at the National Security Council during Barack Obama’s presidency. FILE - A man looks at photos showing North Korean children suffering from famine, at a photo exhibition in Seoul, South Korea, Feb. 27, 2014. Some African countries that promised to end relationships with North Korea later backtracked. Harris said the United States and other international partners should help these African countries fill the gap left by cutting ties with North Korea, particularly with regard to national security, and the training and professionalization of security forces. Bagassi Koura contributed to this report.